Inventory We are a resale marketplace, not a box office or venue. Ticket prices may exceed face value. This site is not owned by Hackensack Meridian Health Theatre . The Hackensack Meridian Health Theatre Red Bank originally opened as the Carlton Theatre in 1926 and is on the US National Register of Historic Places since 2009. 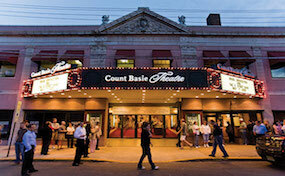 After closing its doors for three years it reopened in 1973 as the Count Basie Theatre before changing its name in 2018. The Hackensack Meridian Health Theatre box office is located on 99 Monmouth Street in downtown Red Bank, NJ. The seating capacity is 1,568. Hackensack Meridian Health Theatre tickets have included performances by Brian Wilson, Tony Bennett, and James Brown as well as an array of other events like theater musicals and family shows. TheatreRedBank.com is not currently affiliated with any official website, promoter, venue and or supplier. We are an independently owned and operated company that concentrates in the online resale of all events in the secondary marketplace. Ticket prices on our sites tend to be above face value but will fluctuate quickly with consumer demand. To order tickets for all Hackensack Meridian Health Theatre Red Bank events please follow the process online through checkout or pick up the phone and call any of our friendly staff at your earliest convenience.